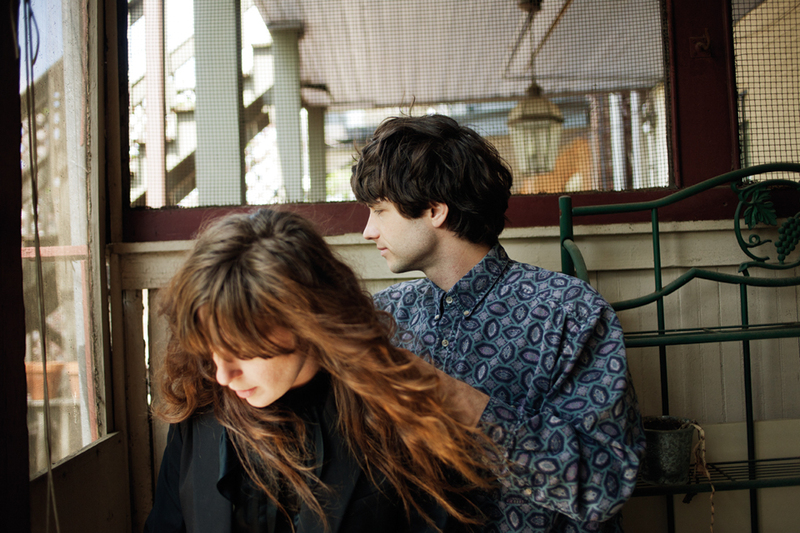 Alex Scally and Victoria Legrand find that Beach House’s greatest influence is the one they have on each other. Alex Scally and Victoria Legrand are sitting in a fully-bloomed flower garden, close to a bright patch of tulips. It’s a blustery spring day in Baltimore that oscillates between prickly heat and shocks of wind. Flower petals surf the occasional gust, and everything smells soapy-clean, like the entire park has been drenched in mild laundry detergent. They were unsure if they wanted to meet here given the title of their latest Beach House record, Bloom, and, in mentioning that, have underscored a potentially cheesy thing that would have otherwise gone unnoticed. Legrand is cross-legged on the grass; her hair arcs over her head like it’s reinforced with wires. It’s not quite a wave, but it isn’t really a curl either. Scally leans towards me. “I have a bunch of questions for you, if that’s okay,” he says, and after launching into a litany of inquiries about my musical history, we meet in the middle through a shared love of My Bloody Valentine’s shoegaze classic Loveless. “I feel like this is important because I think that one of the main problems with interviews we’ve done is that people don’t understand the common ground between each other before the interview starts,” Scally says. What feels like a test for the uninitiated, for Legrand and Scally, is a musical connection that runs so deep, most people can’t get remotely close to it. It’s not that they’re especially guarded, it’s just that, as the duo behind four albums of lush heartbreak, they want the music to come first, not who they’re dating or what they had for lunch. They’ve always been this way, but after releasing their highly acclaimed third album, Teen Dream, in 2010, the Baltimore residents soured on the music industry hype cycle and retreated further into music, further into their city, further into each other. They’ve got countless stories about their reluctance to ever get a manager (they have one now), their hesitation to participate in any sort of staged performance for internet television (they’ve done them before, but would like to stop) and how they’ve never managed to adopt a third permanent member. “We had written three or four songs, and it was like, Okay let’s get a band together,” Scally says. “We tried to talk to a drummer we knew, we’d talked to a guitarist, because I didn’t really know how to play guitar. We wanted to find somebody who played bass, or maybe organ too. We had this whole plan. We’d asked all these people who were like, Nah, I don’t have time. I wouldn’t be a good band member. This one guy was like, Why would you want to do a band? It’s perfect already. That moment was a huge realization—it’s just us! And it’s great!” Beach House might be made up of two people, but their sound is singular, the result of Legrand and Scally spending all of their time together, both on tour and off, which only further fuels the “are they or aren’t they?” questions (they aren’t) that now automatically come along with being a male-female musical duo. If Beach House started out by building sandcastles on that island, they’re now constructing skyscrapers. Since the release of their self-titled debut in 2006, Legrand and Scally have built the band up through a series of tiny movements. With each successive release, their sound gets bigger, the world they’ve created thicker, more rounded and full. In that sense, Bloom feels like waking up from a dream, if all your dreams happened to be made up of the previous three Beach House albums. It’s their brightest and clearest record yet. Jagged guitars rip through “Wishes,” and there’s a head-clearing thump to album opener, “Myth,” that sticks around for the rest of the album. Which isn’t to say that Bloom doesn’t sound as nice as the previous records. The songs still twinkle gorgeously, the signature organs still hum warmly, and Legrand’s voice is now so husky that, if she were a smoker, she could single-handedly make a pretty good case for what cigarettes do to the sound of your voice. “Every album, we get more and more passionate about things,” Legrand says. “You know what you don’t want to do, and it’s in a lovely way. We choose not to settle in safe places. That’s what I think artists do. We’re investigating culture—this bacterial culture that we’re creating. There’s a Beach House sound [but] limitations are important.” As they’ve gotten more successful, the question for Legrand and Scally has shifted from “what can’t we do?” to “what shouldn’t we do?” and Bloom is a result of that canny decision making. For Beach House, it seems that the trick to making universal music is making songs that are just specific enough—to the point that you can’t tell if they’re about how being in a band that people care about is alienating, or if it’s just that life is. On “Myth,” Legrand sings: If you built yourself a myth you’d know just what to give/ What comes after this momentary bliss/ The consequence of what you do to me/ Help me to name it/ Help me to name it. Is it about fans looking to you for support because of the image you’ve created for yourself, or is it about a relationship gone off the rails? More importantly, does it make a difference? If it felt like Beach House’s homemade charm and their hazy universality were inexorably linked, then Bloom is the apex of that idea. It’s a record that’s been meticulously groomed into something larger and more formidable than anything they’ve made before, and it all came together in their unglamorous practice space. 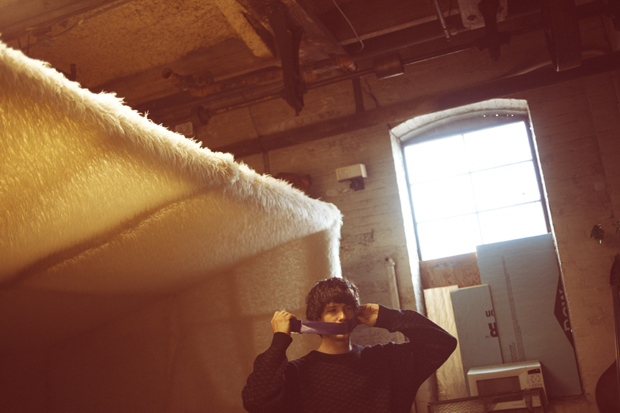 Sharing a floor with a tie factory, the warehouse where Legrand and Scally rehearse looks a lot like a 3-D scrapbook. It’s full of stuff: there’s a stand-up bass, a collection of old organs, thrift store keyboards piled on shelves, a fake portable radio that is actually a flask with an additional hideaway for weed where the batteries are supposed to go, and a picture of Legrand and Scally at the Empire State Building. Oddly, the photo is in front of a backdrop of the Empire State Building, taken from inside the building. These gas station artifacts and bizarre tour finds hold at least a little bit of personal meaning for the pair, but they’re also a perfect physical manifestation of the rickety charm that makes Beach House Beach House. Currently, Legrand and Scally are putting in long hours at the space, prepping for their next tour, loading organ sounds into a newer, more compact and sleek keyboard that they don’t really like, but is convenient for touring. They’re also building their next stage backdrop out of 3M reflective particleboard slats that go in front of a fan. When light shines through, anyone that stands in front is presented in silhouette. It looks like something Wes Anderson might build for a Justin Bieber stage show. Legrand whips out her phone to show a video of the rig in action. She’s standing in front of it, her face completely obscured by darkness. She looks like a rock star. But the seams are visible, and they’re visible on purpose. There’s a Guinness ad, which aired only in Ireland and uses Beach House’s “10 Mile Stereo” as backing music. In the commercial, a black cloud consumes the sky, hovering over multiple cities full of 20-somethings being cosmopolitan 20-somethings. All over the world, the cloud descends, and the people under it clink glasses, dance around massive bonfires and give each other piggyback rides. The premise being basically that Guinness was there when you were having fun, and it will help you have more fun if you drink it. But set against the roiling standout from Teen Dream, it feels almost era-defining, as if you’re not out doing what these people are doing right now, then you’re growing up wrong. There’s a moment on “Wild,” the sparest track on Bloom, where, over rickety, distant drum machines that recall their earliest efforts, Legrand opens up so specifically that it’s hard to pretend it’s about anything else other than herself: My mother said to me that I would get in trouble/ Our father won’t come home cause he is seeing double/ Out in the endless green/ Your eyes are so misleading/ That's when your car pulls up its hood is black and gleaming/ And in a while/You start a smile/ The earth is wild/ We’ve got no time. Then the guitar shoots upward like a signal flare and everything feels joyous, even though those lyrics are about as resigned as it gets. 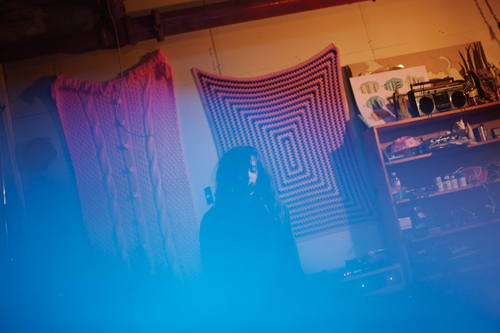 It feels exactly right that the track comes seven years and four albums into their career, because ever since Legrand and Scally discovered that Beach House affected people so universally, the only place they could go was further inward into their music, but also further into Baltimore’s secluded art scene. 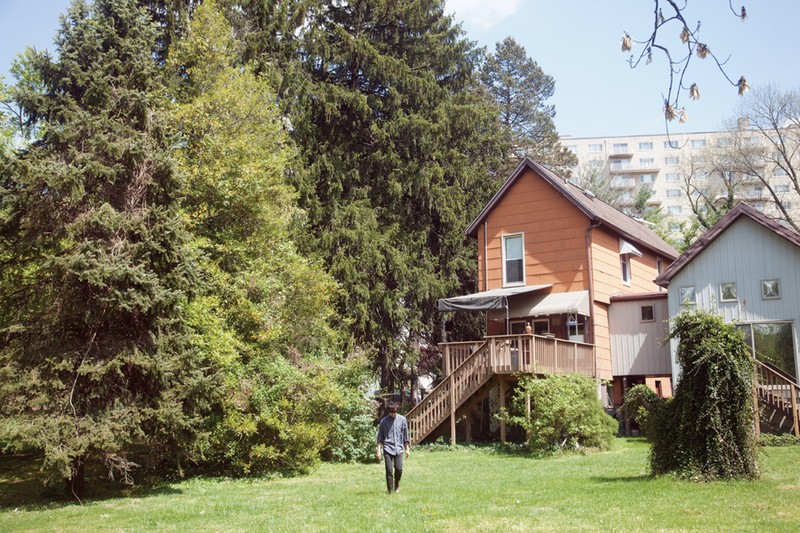 Driving around in their tour van, they point out their old practice space near a maximum security prison, and then right after that, Dan Deacon’s house. Deacon made a name for himself by making bizarrely inclusive music-as-performance art, and while he sounds nothing like Beach House, they’re still close to him. It’s this sort of thrown-together vibe that has made Baltimore such a vital place for the pair to make music. It’s not dictated by a constant desire for fame, but instead by a deep need to make art, even if that art differs wildly from the people around you. Later that night, Scally and Legrand are more than a few drinks deep at a hole-in-the-wall bar in Mt. Washington, where Scally grew up. They’re joined by Dan Franz, Beach House’s touring drummer and friend, who also happens to be the only person to have successfully penetrated their two-person world. Conversation turns to John Waters, the Baltimore-based director that has fashioned himself into something of a guru for the city’s scrappy artistic community, hosting yearly Christmas parties to which Scally and Legrand are regularly invited. Legrand’s had a couple whiskeys and is feeling wide-eyed and sentimental about art. This doesn’t seem like an especially rare occurrence, but still, when she gets going, her eyes glitter like she’s never been more excited about music. “John Waters is the kind of artist that makes entertainment like…” she trails off, seemingly at a loss at how to describe Waters’ ability to portray the deeply weird tendencies of artists in his films. “Why are people so insecure? All performers are so insecure and need affirmation,” she stares at a corner of the bar’s low ceiling. “Is that what this is? That all humans—they just want to hear themselves to prove that they exist?” Pretty soon, the bartender will say it’s last call. 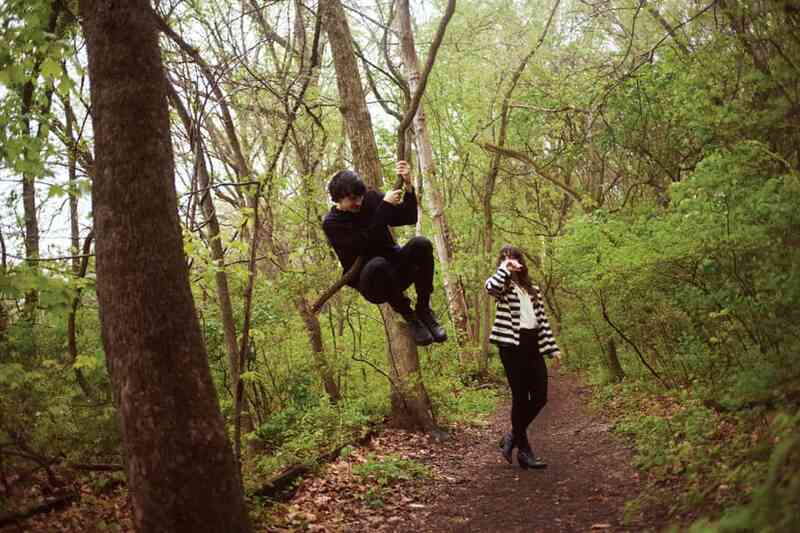 Scally will drop Legrand off at home, they’ll go to sleep, wake up, and continue to work on making Beach House better.